This detail of a larger map in the book shows RTD's high-frequency transit network. From "Trains, Buses, People." All map images: Island Press. 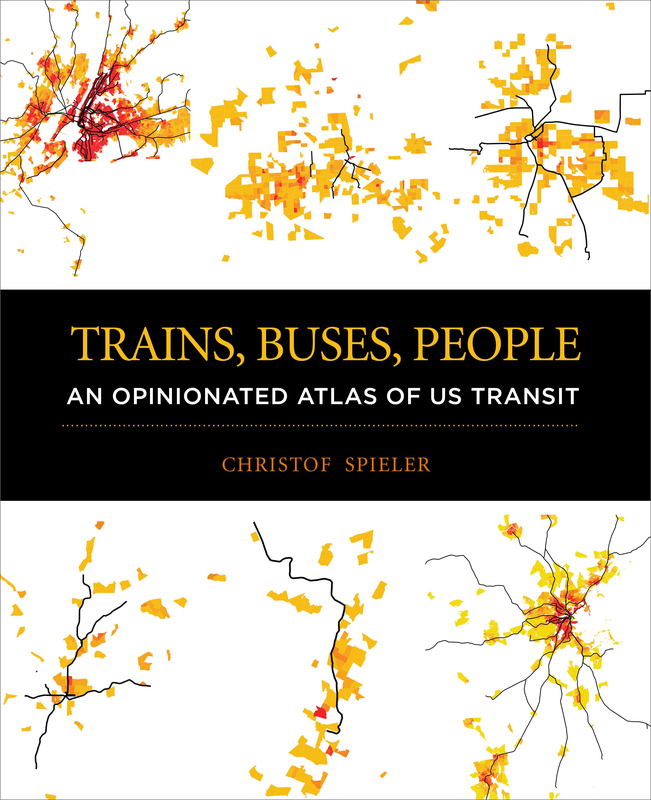 Trains, Buses, People: An Opinionated Atlas of U.S. Transit, by Christof Spieler. Denver built a transit network that most people don’t use. It doesn’t go where they want to go. Trips take too long. And the primary hub, Union Station, is three-quarters of a mile from the heart of downtown’s job center. The book, which looks at public transportation systems across America, starts with a quick discussion about the essential but often neglected features that make transit successful. What follows in most of its 264 pages is a fascinating atlas that profiles 47 transit systems, including Denver’s Regional Transportation District. For each city, photos, maps and infographics complement easy-to-follow writing, illustrating what each city gets right — and where they fail. 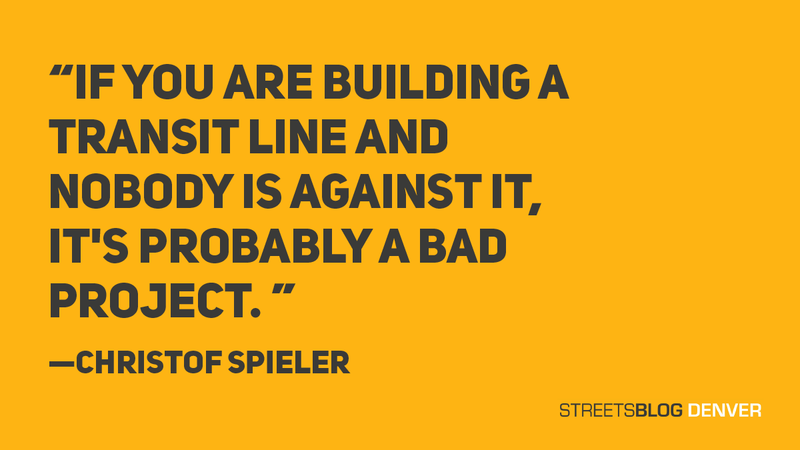 In a recent interview, Spieler shared his thoughts about Denver. Andy Bosselman conducted and condensed the interview. Q: Your book starts by talking about what makes transit successful. Tell me about that. A: When we talk about transit, we should always measure it in terms of how useful it is to riders. First of all, does it go where they’re trying to go? Does it go there frequently, so they won’t have to plan their lives around it? Does it run long enough, so that it’s there for them when they work late? Q: In the book, you mentioned that Denver’s regional light rail system doesn’t serve the city of Denver well. It doesn’t go to the densest neighborhoods. It doesn’t go to the main hospitals, shopping districts or cultural institutions like the museums. A: In Denver, the light rail system is focused on serving suburban-downtown trips. It generally provides a really good level of service, a really good level of reliability and a really good level of amenities. The question is simply, does it go to the places where people want to go? 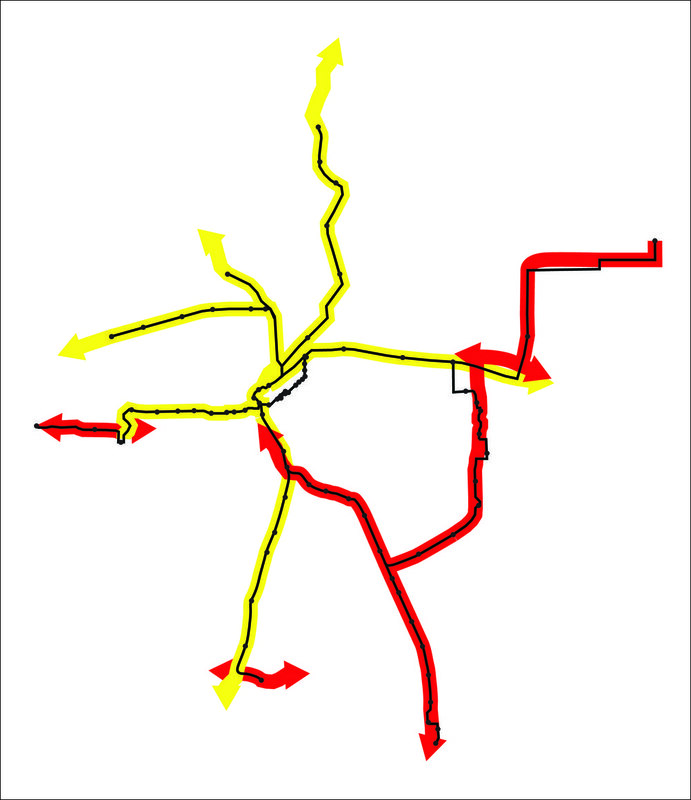 Denver’s built its rail system along existing rail lines (yellow) and freeways (red), which allowed it to build the system quickly. “But it means Denver has a lot of rail in sprawling, pedestrian-hostile places and even urban stations are surrounded by infrastructure with no useful transit destinations,” says Spieler. Q: Where light rail does go, you say the stops often are not located in places that are useful to people. A: You have things like the [Anschutz] medical center and the Tech Center, which are real activity centers. If you serve those well, they can get you a lot of potential ridership. Both have light rail kind of near them, but not in the middle of them. [At the Anschutz Medical Center] there is a light rail station off to one edge. But if you actually map things out, much of that campus really isn’t within a reasonable walk. The Tech Center is a very similar situation, where there is light rail. But it’s on the opposite side of the freeway. If you want to get any of those jobs, some of them are really outside walking distance. But even the ones that aren’t, the first part of your trip is walking across this giant concrete moat. Q: Those seem like very basic mistakes. Where did Denver go wrong? A: A lot of those are decisions are political. It may well be that RTD actually wanted to get to get this transit right into the middle of things and they got pushback. When you put transit into the middle of things, it has impacts. There may be fewer places to turn left. There is going to be construction when it gets built. Those businesses, those residents are going to be concerned. If you are building a transit line and nobody is against it, it’s probably a bad project. Because it means you’re not going where it actually affects anybody. You’re going where nobody wants to go. This detail of a larger map highlights the long distance between Union Station and the heart of downtown. Q: And Union Station isn’t exactly where most people want to go. A: In terms of making a really amazing place out of what was largely dead, Union Station is amazing. As a development, it is extraordinary. But as a transit idea, it doesn’t seem nearly as strong. The biggest hole is the idea of Union Station as a transfer hub on the edge of downtown. A large part of the light rail lines and all the commuter rail lines don’t actually go into downtown. They stop on the edge of downtown. Then you need to get off and get onto the [Free Mall Ride], which makes all of those trips less convenient and all of those trips slower. Imagine something where the Mall Ride is actually converted to light rail. And light rail trains go right through the middle of downtown and serve the same Mall Ride function they do today. But they are also a continuation of [each] line. [Unfortunately] that would be a big change to infrastructure that was just built. Q: Should I imagine rail on Colfax, too? A: The Colfax corridor has higher ridership than any of the individual commuter rail lines. Yet it is still a local bus in mixed traffic. [The planned Bus Rapid Transit line for the corridor] is a really good project and will be a vast improvement. If you look at the advantages of rail over BRT, rail has a higher capacity. And when you have rail lines that are much lower ridership than that BRT line, you can definitely ask the question: Shouldn’t that have been rail? Q: Your book brings up how race and class factor into decisions about where to put bus and rail lines. A: There is no place in the United States where race and class aren’t somewhere beneath the surface — and often quite explicit in the planning discussions. That’s something we need to really be serious about. In Denver, suburban-downtown trips, which are fundamentally what the Denver light rail system is focused on, that’s based on a mental model of who you are trying to attract. In calling somebody a transit-dependent rider, you’re essentially dismissing them. You’re essentially thinking of them as somebody who has no choice but to ride our system, which means there’s no argument for making the system any better for them. One of the things we really focused on in Houston was saying we want to improve our bus network so that people who are already riding this system have better trips. This detail of a larger map compares the Denver metro’s population density to where high-frequnecy transit is located. “It is kind of amazing how rarely you will see population density maps when there is a discussion of overall trends and network planning,” says Spieler. Q: You are known in transit circles for helping Houston Metro redesign its network of bus routes. Your focus on getting essential elements right helped the redesign grow ridership at a time when many cities, including Denver, have seen fewer people taking transit. You say that Denver has some room for improvement. A: If you look at where Denver has its frequent [but] service, it correlates pretty well to the population density. It goes to where people want to go. But on the local bus network, you have much less reliable service. You have much lower-quality stop amenities. That transit, even though it goes where a lot of people want to go, is generally lower quality and thus less useful to people. One of the things that Houston does is think of the light rail network and the bus network as one single network. Other cities, too, really see the [two] as working together, as part of one system. And that feels like an opportunity Denver has not taken. I focused on criticisms, but are there some things Denver gets right that we didn’t cover? There is no other commuter rail line in the entire United States which is frequent as the A-Line in Denver. Which is humorous, it literally runs through open prairie. And the dense suburbs of New York have much worse service. The Denver fare system [which integrates commuter, regional and local trips into a single fare] is actually working in the right direction. It’s a big deal and something that a lot of U.S. cities would benefit from doing. I keep hammering the new Denver moves transit plan that the downing st 12 bus which serves the densest neighborhoods in the city, connects multiple hospitals, schools and two train lines, was not designated as a high-frequency service and only runs every 30 minutes for most of the day. Also, a year ago RTD planned transit signal priority for the 10 line but as far as I can tell this has not been implemented yet. We are very good at paying consultants for plans that never get acted on. And why doesn’t the 10 go to 10th and Osage? Well I use it to take my kids to elitches all the time but I don’t think I’ve ever seen another person ride it to the end with us. And I’m always delighted when I can agree with you re; Downing St. It may be that Denver needs its own more localized frequent route; perhaps a bus that only seats about 35 passengers might even do the trick. With respect to transit signal priority, don’t know about the 10 but I suspect people’s expectations might be too high for what it can achieve in reality. Not only is it only every 30 minutes during the day, it’s hourly after 7 PM and on Sundays. One, when the new CU Med Center was being designed, they didn’t want light rail going thrrough the new campus, there was pushback, at the same time FasTracks was being finalized. Two, the whole reason Denver has rail transit, of any kind, is because of buses not going to a central hub. By forcing people onto the Mall Shuttle fior that last mile, it both improved bus service, outside of downtown, and justified investing in the first light rail line. I’ve also heard there was a plan to run light rail down broadway instead of along I25 but the businesses there objected. So shortsighted. Yup, it was originally intended to go roughly through the middle. UC Health didn’t want the light rail vibration given the highly sensitive research etc that occurs. Many other hospitals have also objected to this risk; nothing unique to Denver. There will always be reasons (and excuses) given to justify the pushback to locating transit where it makes most sense. When there’s pushback, like at Anschutz, transit agencies and advocates should push right back (I think that’s what Spieler would argue). I’m sure a thousand examples could been found around the world where rail lines come in close proximity to sensitive medical equipment. Nearly all of Paris and Tokyo have trains rolling underneath. The problem certainly could have been addressed in a different way. IIRC, light rail was originally intended go along Montview Blvd and RTD did resist changing it. The issue wasn’t with the hospitals which are all along 16th ave; rather it was the research, both by the university and the private sector that would be along Montview. This was also unique b/c IIRC the site was deeded by the DOD to the ‘development authority’ essentially a collaboration between City of Aurora and the University of Colorado. It wasn’t until later that Children’s decided to move and the VA was a moonshot that hit. The shuttle isn’t that useful, due in part to its insane headways—alternating 3 and 12 minute intervals during the day, on top of the fact that the shuttle doesn’t have real time tracking like other RTD buses. On a somewhat related note, Denver Health is spending upwards of $40 million to build an employee parking garage on 6th ave. If they had spent a fraction of that on enabling employees to commute by transit (such as a usable shuttle to the 10th and osage station) they could have avoided a large part of the parking garage cost. As I recall the issue was less the vibrations than the fact that no one wanted to pay for the mitigation, as happens elsewhere in the world. The bigger problem is that RTD then went ahead and chose the absolute least convenient location on the entire campus for a light rail station. Other options could have included going on the north side of Colfax between the street and hospital parking lots, on 16th behind the hospitals, or even through the fields and golf course north of Montview. Instead we got a stop a quarter mile away from the already-inconvenient stop location through a field, across a wide street, then a couple hundred feet to the left. Ah hah, I wasn’t aware of all that; that’s interesting. My understanding was CU wasn’t comfortable with RTD’s possible mitigation but it’s also possible needed extra funding was an issue. I’d agree with the results. I always figured they should have gone in front along Colfax and then just turned onto Peoria. They could have had a stop in front of the hospitals and again near Montview. Not sure why that wasn’t chosen? At the A Line grand opening, some idiot politician actually pointed to the R Line realignment in his speech as an example of successful stakeholder coordination. I couldn’t believe my ears. The remote Fitzsimons station location and the massive amount of parking on the Anschutz campus make the R Line essentially useless, and the ridership numbers show it. Such a tragic missed opportunity for Aurora and the region. Should I imagine rail on Colfax, too? East Colfax is too ‘localized’ for light rail. Modern Streetcar would be a better option. Denver has been studying this corridor for a decade and determined a Streetcar didn’t save enough from light rail and the cost of BRT was too attractive in comparison. Even with BRT the city is struggling to move forward to construction including finding funding. RTD isn’t a city organization it’s a state organization and the State funding keeps getting rejected by voters in the suburbs. Denver needs it’s own transportation organization that can work with RTD and be funded by Denver’s tax payers who always overwhelmingly vote for transit funding increases. Excellent point. RTD is actually a metro organization funded by taxpayers within its district. It’s existence was authorized by the state as the state didn’t want to be in the transit business. It was Metro voters who easily approved of FasTracks and another plan is needed in the $15.5 billion range. Denver having its own DOT makes good sense. For example, Seattle has it’s own DOT and voters approved a $920 million transportation initiative in 2015. But it was the metro area that approved $54 billion in new taxes for transit in 2016. What state funding has been rejected by voters? Denver doesn’t need its own transportation org it just needs to further supplement RTD like the dedicated bus lane on Broadway. Denver should be making sure that all sidewalks are built out within a half mile (or more) of transit stops, upgrading bus stops etc. Well, we already built the system. Criticizing it now isn’t going to help anything. We can’t fix what’s already been built. Denver metro needs to follow the lead of other cities. Seattle and Phoenix, for example both have voter approved funding for over $50 billion for transportation/transit while L.A. voters approved $120 billion in funding. Portland is planning a voter initiative for $20 billion in 2020. Denver needs a metro initiative for say $15.5 billion. RTD isn’t exactly popular, though. How do we get Denver voters to approve funding for transit, especially if that funding will go directly to RTD? Fair question; it can be tricky but doable. Last time around everybody liked the plan because everybody got something. The system may not be popular among Streetsbloggers but the metro as a whole is still satisfied. For Denver specifically, it will take ~$2.5 billion to run light rail from the Civic Center Station down Broadway, then along the Speer/Leetsdale corridor PLUS an extension down So Broadway to the I-25 station. Last line should be along Colorado Blvd from the I-25 station up to the 40th and Colorado A Line Station. In my last iteration I had $8.5 billion going to RTD while $7 billion would be divided among cities and counties for them to decide for themselves. There are a number of transit enhancements that could be directed to both the City of Denver and the metro area. A portion of the tax revenue needs to be set aside for added RTD operating expenses. Everyone except the line up North that keeps getting pushed out while all the others get built and yet we keep getting fleeced. There was always going to be a line that gets built last and the cost per rider is highest on the NW corridor, so it should be built last. This was supposed to be done by 2014. So were plenty of other lines. I guess we should just continue to feed the beast and not demand accountability, right? No and my original point remains. I doubt that would happen, you still have RTD service including fasttracks service. But it’s not like the area has come anywhere close to funding your portion. Especially after they have and continue to steal tax money and not deliver on their commitments. No way in hell would I vote to give them more money. Satisfying the appetite of Boulder County should be easy (or at least doable). I understand there’s an attempt to get some numbers out of BNSF for utilizing their lines for rush hours. Other options would be Modern Streetcar for Boulder. Boulder County also has BRT aspirations that would serve cities along the intended rail route. For Longmont? They’re next in planning for BRT between Longmont and Boulder. What would make Longmont happy? Modern streetcar? Is that something like a modern 8-track? No, it’s something like a modern horseless carriage, aeroplane, bicycle, icebox, light bulb or any number of things invented 100 years ago but still have undeniable practical value today. So what? More people today use 8-tracks than ride trolleys. Cost per mile is pretty misleading since “light rail” encompasses lots of subway-grade projects (e.g. LA, Seattle) that are expensive but will eventually provide a much higher level of service. Yes, that’s very true, well said. Cost per mile is an imperfect comparison but it’s the only really good equalizer between different projects. Seattle not only includes some below grade sections but virtually all of their light rail will be grade-separated. They are on a pace to spend $25 billion on their ST2 & mostly ST3 new light rail lines and extensions. But when you have $54 billion to play with then why not? I’m an electric car driver in Washington state, moving to the Denver area this year. I would be happy for half of my electric car road tax (you have that in CO, right?) to pay for public transit improvements. I want the other half to be used for more electric charging infrastructure. It’s currently impossible to traverse the state on the I-70 corridor in an electric car because the L3 charging network is so poor. If you made the train connections better, and had more park-and-ride that actually connected things, I would use transit more (I’ve been visiting regularly for over two years and have used the train exactly once, to attend the Women’s March downtown). While I love to drive my LEAF and find it convenient, I would actually be willing to pay HIGHER taxes to support improved public transit. It’s good for the entire region and for the planet even if it doesn’t benefit me directly. I have voted FOR every Sound Transit funding package here in King County, WA, over the past 20 years and the glacial pace of construction has really frustrated me. There is a $50 annual EV fee in CO, it’s definitely going to have to get raised sooner than later. Short answer. Cities plan their transit schemes where the lobbyists and politicians tell them to go. It’s what happens when you fund transit with predominantly tax dollars instead of user fees. Like building transit stations to convention centers when convention centers across the nation lose money (especially since there’s more convention center space then there are actual conventions) or to new developments paid for with TIF dollars. To clarify the difference between taxes and user fees. If a user pays a fee or tax and the money goes to whatever it is that the user is paying for, then it is a user fee no matter what you call it. But when a fee that is dedicated to a convention center is paid by motel or hotel users who aren’t going to the convention center, that is a tax. So America’s Transit “Crisis” is an example of too much money spent in the wrong places. Politicians who are more interested in getting their pictures taken cutting ribbons than in making sure our transportation systems run safely and smoothly. The country doesn’t need more infrastructure that it can’t afford to maintain, especially where cities have ignored decades of needed maintenance. Instead, it needs a more reliable system of transport funding, and that means one based on user fees and not tax subsidies or federal deficit spending. The reasons for transit’s decline are numerous and far too diverse; that transit agencies and governments have no control over. System overcrowding, poor hygiene, restrictions on food/beverage/pets versus automobiles. Privacy and Security concerns. Life’s complications and destinations are beyond the service. It doesn’t carry freight which generates revenue well enough. Besides the fact, Carrying large packages, suitcases, or shopping bags on transit is awkward at best and impossible at worst. Transit infrastructure is crumbling faster than cities can hope to fix. Alway fun to read your take on things. Fortunately in Denver’s case a doubling of the convention center put Denver on the convention map with business zooming. Eh, it not one of the convention stars like Vegas or Orlando; it’s more of a Tier 2 city which suits Denver well. But I get your points. Don’t get me wrong. The statements I make on streetsblog. they’re realistic, no so much pessimistic. The fact is transit industry is hostage to government, before 1965 most transit in the US was private and profitable. Now they’re municipalized, federalized and operate at massive deficits and huge maintenance debacles. Combined with state financial obligations to public employees in the financial red; transit agencies should while putting their economic houses in order by reducing maintenance backlogs, debts, and unfunded obligations. (Sadly) many Blue States pretty much confirm your points and states aren’t allowed to print money like Uncle Sam can. Fixing the Dept of Transportation could save the taxpayers billions over 10 years. I visited Denver for the first time last week and actually wanted to ride the light rail system after reading so much about it. Unfortunately, all the attractions I visited were nowhere near the stations. Also, this goes against popular opinion but 16th St mall needs a redesign. A bus only lane which people often walk in doesn’t do the plaza any favors and hurts the pedestrian experience. Either convert the lanes to streetcar or make the plaza pedestrian-only. 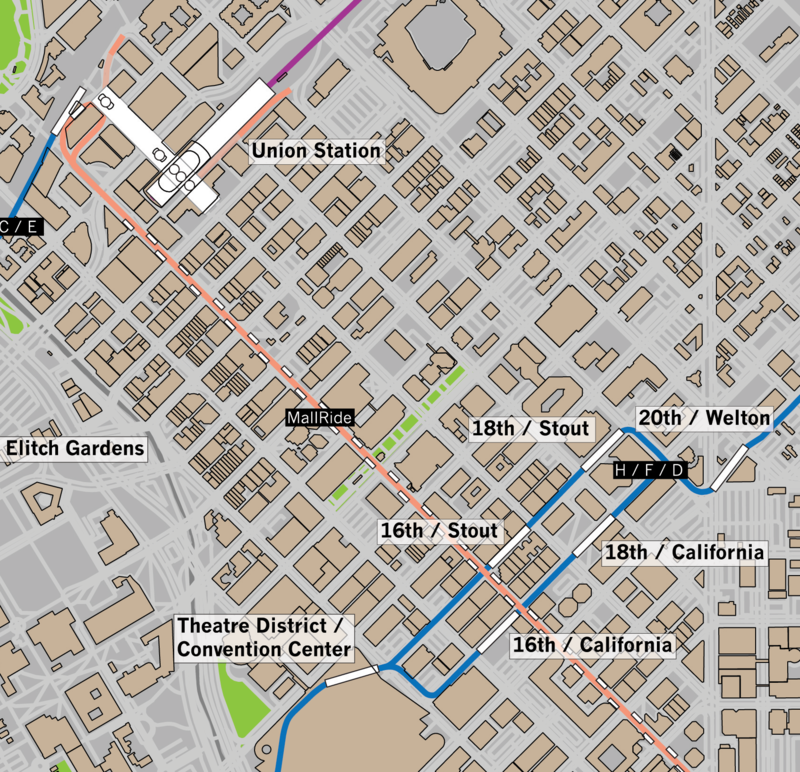 If you took the 16th street mall shuttle from one end to the other you realize that it runs between two transit hubs that bookend downtown – so the buses will stay. They do intend to redo the mall with buses likely running down the center which would provide more sidewalk space on each side. They’re also considering varying the layout. It’s been a long drawn out process as often is the case. It’s complicated by the original federal funding and it’s historical I.M. Pei design. I’ve learned a lot reading through this thread, thanks to all that have commented! I am curious to know if there is an article, a book chapter, etc… that provides an overview of how Denver’s rail system was conceptualized? Who were decision makers, what was initially desired but modified, what was the pushback, who was providing pushback, etc? Like most places the history goes back over 3 decades with the 1st 5.3 mle line opening in 1994. The first suburb to city line which was like 85% funded by federal grants opened in July of 2000. Traveling from downtown the SW LIne went to upscale areas of South Denver. TV coverage showed the Park N Ride with over 1,200 spaces packed and overflowing by 7:00 a.m. which put an end to the conventional wisdom that nobody in Denver would ride light rail. That ultimately led every metro Mayor to want in on the light rail action. In 1999 Denver voters approved the SE Corridor T-REX project to add lanes and 19 miles of light rail to I-25/I-225. With light rail now going SW and SE it just heightened the desire and push for other parts of the metro area to get their fair share. In 2004, voters approved Fastracks which (will) add 5 additional light and commuter rail corridors. If only the trains ran on time, or would at least go back to being reliably late. The A was reliably a few minutes late. Now after the “upgrade” to four car trains, 10 minutes is more typical. Even the old W, which used to run like a German train i.e. on time, is now reliably a few minutes late. I purchased a fourth car to make the cross town commute time competitive with a bad day on 70. I’m seriously considering just driving, it may be less frustrating than missing a few trains a week. The A line reliability is in the high 90s and I believe all RTD trains are in the 90s for reliability. Do you ride them regularly? I ride daily. The A line used to be a few minutes late reliability. Annoyingly it would be actually on time once a month so one can’t just show up a few minutes late. In January, the same day they went to 4 car trains ,10 or more minutes late is now typical. RTD has not published official statistics on the A that I can find, look on their website yourself. Many 2016 statistics on the other lines, but no A. They have made press releases stating that the A arrives “on time” in the 90 something percent of time, with on time defined as within 15 minutes. Saying 15 minutes late is “on time” for a train that runs every 15 minutes for a journey that is supposed to take 37 minutes is hilarious. That is a 40% miss. If I could only give 60% at work and keep my job it would be glorious. The W is typically only a minute or two late, I can’t comment on the other lines. One time is one time. Late is late. 15 minutes or 40% late is pathetic not “on time”. I’d say that Denver’s buses and trains are not useful to most people because most people do not live within one-half mile (probably not even within one mile) of a transit stop. Before the 1970s RTD’s bus system was point-to-point, perhaps based on where lots of people were going, and maybe even how the people were spread out in the young-ish city. I am guessing that as more and more homes were sprayed around the prairies, and more and more rural business parks were developed, it became more difficult to find point-to-point routes that serviced lots of people. Thus came the grid-system (late 70s, early 80s?). This is pretty much all speculation on my part from having lived here for nearly 50 years. But in general, when city planning consists of figuring out how many homes and businesses can be spread around a large area (because everyone has a car and everyone can drive where they want), the resulting “transit” system can never be very good. And it certainly cannot service most people. Perhaps in another 50 years things will have become more transit centered, resulting from an increase in development at or very near the train stations. But it is not like they are going to relocate complete hospitals, or DTC-like areas, so perhaps in 100 years the new train lines will be built directly into, and between, the existing population centers. Good points; it’t important to understand Denver as it is which lacks the dense area/corridors of many cities. It’s changing fast but it’s not there yet. The issue has been, and as far as we can see will be, is that there are no population centers to connect. One thing I think that would help is have a non stop Light rail train every hour or half an hour from the burbs to downtown (Lone Tree to Union Station, e.g.). At least during the morning and evening rush. When doing the daily long distance commute the incessant stopping every 2 minutes to pick up or drop off passengers is so time wasting. Nothing more than an electric bus on steel rails.